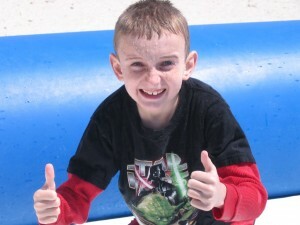 Joshua's NIH Adventure » Blog Archive » Happy Birthday Josh!!! Josh turns 11 today and we’re celebrating the incredible blessing that he is to us and to so many others. Feel free to leave birthday greetings in the comments. This entry was posted on Tuesday, March 16th, 2010 at 11:11 am	and is filed under Comments. You can follow any responses to this entry through the RSS 2.0 feed. You can leave a response, or trackback from your own site. Happy Happy Happy Birthday! I hope you have a super wonderful awesome day! Thank you for having me over to play with you, it was lots of fun! Let’s do it again! I will keep praying for you. I will miss you a lot cause you are my friend! I hope you got lots of cool prizes! So thrilled and excited for you, what an incredible couple of weeks you and your family have had. Our best wishes for a great new year of life. You are the best present ever for your Mom and Dad, just remember that ! Happy Birthday a day late, Josh, and Happy St. Patty’s Day to the whole family!!! Would love to see what you created with those leggos you got! We hope you had a great birthday. We love you!!! Thanks for everybody for the birthday wishes! I had so much fun on my birthday! Me and my cousin Caleb went to Chuck-e-Chesse. I won like 6 prizes! They weren’t super fancy prizes though, just small ones. Thank you for praying for me and God bless you all!